Enjoy extra savings with our 3 pack of D.A.P. Refills. 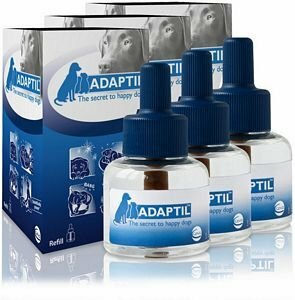 Dog Appeasing Pheromone REFILLS for your D.A.P. diffusers. Female dogs secrete pheromones that comfort and reassure their nursing puppies. These "appeasement" pheromones have the same calming effect on adult dogs. D.A.P. mimics these appeasement pheromones to reduce or eliminate stress in dogs of all ages.